The trend in K-12 education has steadily been towards teaching students skills and concepts that will be useful to them in college and beyond. No longer are teachers solely responsible for a specific curriculum -- the focus has shifted to skill sets like problem solving, critical thinking and collaboration -- transferable skills useful no matter where a student ends up. The problem is that many colleges haven’t moved along the same progressive path and are still teaching students in large lectures courses that make little effort to connect the material to the lived experiences and passions of students. 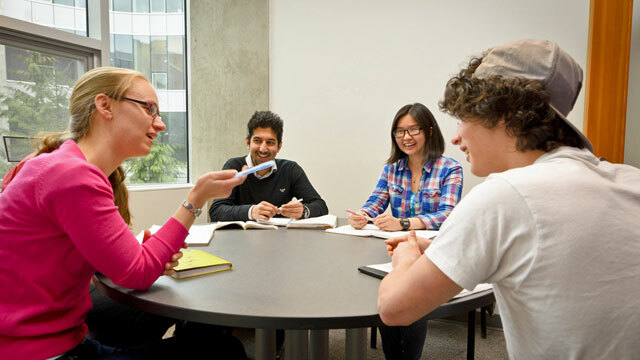 A college in British Columbia, Canada is trying to change that trend, emphasizing depth over breadth and aiming to develop highly interdisciplinary students. “We need an education for the knowledge economy in which people are equipped with the processes to filter, combine and create new ideas and products for themselves and for society,” said David Helfand*, President of Quest University Canada in a discussion with American RadioWorks’ host Stephen Smith. The college’s structure reflects this commitment to well-rounded creative students. There are no departments in the college. The academic building is circular, with professors randomly assigned to different offices, making it easy for experts of different disciplines to collaborate and converse. It also breaks down hierarchies -- a core feature of most universities. Students take classes in a series of blocks, focusing on only one class at a time. “This allows for a depth of immersion and engagement with a subject that’s simply impossible when a student is juggling four to five courses at the same time,” Helfand said. For the first year, students take a broad array of subjects, exposing them to many disciplines. After that, they pursue a question that inspires them and is interdisciplinary in nature. Each student explores that question with a faculty member and every student graduates with a degree in arts and sciences. The model is based on the premise of how things work in the real-world: problems are interdisciplinary and require collaboration. “Employers want people who can communicate effectively in writing and speaking; they want people who can reason laterally; and most importantly they want people who can collaborate with people from other parts of their organization,” Helfand said. He’s not convinced the majority of universities are preparing students for that kind of work experience. "We need an education for the knowledge economy in which people are equipped with the processes to filter, combine and create new ideas and products for themselves and for society." Before his time at Quest University, Helfand taught astronomy at Columbia University for 30 years, and was chair of the department. When teaching a topic like the laws of planetary motion at Columbia, Helfand would draw diagrams of a planet orbiting a star, with arrows to key terms and equations related to the diagram. He might work out a sample problem on the board, so students could see how to solve the equations. The whole lecture would take about 20 minutes. Faculty also conduct research in a non-traditional way. Each professor proposes a five-year project he or she wants to work on -- whether that’s related to their doctorate or not. It could be a project that focuses on pedagogy or it might look like a more traditional scholarly article or book. “They might decide to think deeply about something that’s tangentially related [to their disciplines] or it might be completely unrelated,” Helfand said. Either way he’s convinced that extra study adds richness to their teaching. For the privilege of attending this non-traditional, hands-on, collaborative, self-directed university experience, students pay $29,000 (in Canadian currency). That’s particularly expensive given that the average Canadian university student pays less than $6,000 for other schools. * A little more than half the students are from Canada, while another 34 percent come from the U.S., and the rest from all over the world. *A previous version of this story incorrectly stated that most Canadian universities are free when in fact the average student pays $5,772 in fees. The original version also incorrectly identified Quest's President as John Helfand, when his first name is David. The article now reflects those changes.